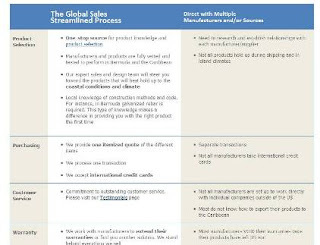 Global Sales: What Makes Global Sales Different? What Makes Global Sales Different? Often when we talk to a new customer, the first thing they ask is what makes Global Sales different or what can you offer that other companies can't. 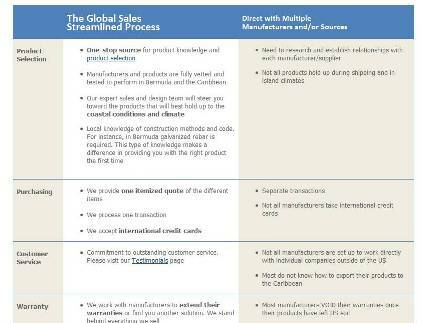 We've put together a quick side-by-side comparison of what Global Sales offers vs. working with other companies. Exporting products to Bermuda and the Caribbean is what we do – and we do it well. We know how things have to be packaged, what paperwork is required, and what the shipping deadlines are, so that your shipment will be accepted and your project kept on track. We focus on the big picture of your project and – at the same time – handle the small things that make a big difference to your budget and your schedule. We always send extra finishing pieces, we make sure your items are properly marked, we stay on top of your order through our established relationships with manufacturers and shippers. YOU are our business, and we are dedicated to knowing and doing everything possible to help you succeed.